A common piece of advice for investors is that long term success doesn’t hinge on timing the market. It’s time in the market that may make the bigger difference. Most investors aren’t professionals. Accredited investment specialists devote their education, training, time and resources to studying the markets and individual companies. Yet all professional fund managers will miss the ups and downs in the market from time to time. It stands to reason that individual investors who try to pick the best time to get into the market or get out of it will likely be more prone to “missed timing”. Financial advisors frequently tout the benefits of a buy and hold strategy combined with dollar cost averaging. Specifically, they advocate investing in the market on a regular basis and sticking with investments and a strategy over an extended period of time. Let’s look at an example of a buy and hold strategy where individuals stay invested in the market for various periods of time. Four friends start an informal investment club: James, Stacey, Jazmine and Vincent. Each commit to investing $10,000. 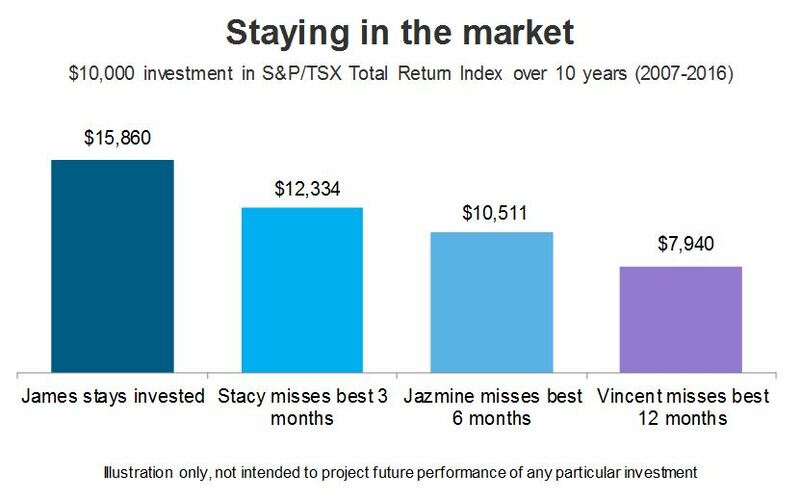 They pick the same investment, the S&P/TSX Total Return Index. They each make separate choices to invest, get out of the market for a while and reinvest during a 10 year period starting in January, 2007 and ending in December, 2016. Each person that gets out of the market for a period of time puts their money into 3 month T-Bills. Each person that gets out of the market happens to miss the best months’ performance. Then they compare results. James is an example of an investor who took a long term “buy and hold” approach. In doing so, he managed to avoid a major risk of trying to time the market: missing some of the best months of an investment’s performance. Of course, you may also consider what happens if you miss the worst months in the performance of an investment. Working with a financial advisor may help you optimize your return on your investments, minimize the downsides of investing in the market and help you reach your goals.